A visit by the president of Azerbaijan to Berlin on Wednesday (21 January) marks a milestone, and an obvious warming of his country’s relations with Germany, against the background of the Ukraine crisis. Ilham Alyiev was received by German Chancellor Angela Merkel, who called Azerbaijan “an increasingly important partner”, according to the website of the Federal Government. Merkel said that she discussed the conflict between Ukraine and Russia with Aliyev. We want to see results,” said the Chancellor, who hopes that “structures will emerge” from the meeting. More pessimistically, she also said that at the moment Russia and Ukraine were “moving further away from the Minsk Protocol rather than making any progress on implementing it”. The Protocol provides for a ceasefire and the withdrawal of heavy weapons. With a view to the conflict over Nagorno-Karabakh (see background), Merkel and Aliyev reportedly agreed that the conflict should be resolved peacefully. Germany is a member of the OSCE’s Minsk Group, and in this capacity is supporting a negotiated solution, Merkel added. The Minsk Group is observing the conflict and spearheading efforts to bring about a peaceful and consensual agreement in talks with Armenia and Azerbaijan. The German Chancellor also expressed her concern over the increasing incidence of ceasefire violations and offered support in principle. “Germany would like to offer help in resolving the problem.” She reported that they had discussed whether or not the EU ought to take the initiative. According to the website Vesti of Azerbaijan, Merkel also said that Russia “plays a role” in exacerbating the Nagorno-Karabakh frozen conflict. She is quoted as saying that “Armenia and Russia stick to a common position on this issue”. In September 2013, Armenia abandoned plans for EU association and decided to join a customs union led by its former Soviet master Russia. Since then, the rapprochement between Yerevan and Moscow has increased. Russia has extended the agreement with Armenia over its military bases in the country until 2047. Merkel stressed that the German government “expressly” supports the Southern Gas Corridor project. The term stands for a project to bring Azeri gas from the Shah Deniz offshore field to Europe via the planned TANAP pipeline through Turkey and the Trans-Adriatic TAP pipeline via Greece and Albania to Italy. An interconnector in Greece is planned to bring Azeri gas also to Bulgaria and further North. Germany hopes that this project will help diversify Europe’s energy supplies. According to the German government’s website, since 1994 the Azerbaijani government has been exploiting the country’s huge oil and gas reserves in partnership with western companies. Germany mainly imports oil from Azerbaijan; in 2013 it imported €2.2 billion worth of Azerbaijani oil, making the country Germany’s seventh largest oil supplier. Merkel said she hopes to see even closer economic relations between Germany and Azerbaijan in future. “I believe that we still have potential to expand our economic relations.” She pointed out that German investors could be helpful in expanding infrastructure and diversifying the country’s economy. Legal certainty is a crucial factor, said Merkel. In June 2103, Azerbaijan reached an agreement for the acquisition of a 66% stake in Greece’s natural gas transmission system operator DESFA. Russian companies were also interested in the acquisition. 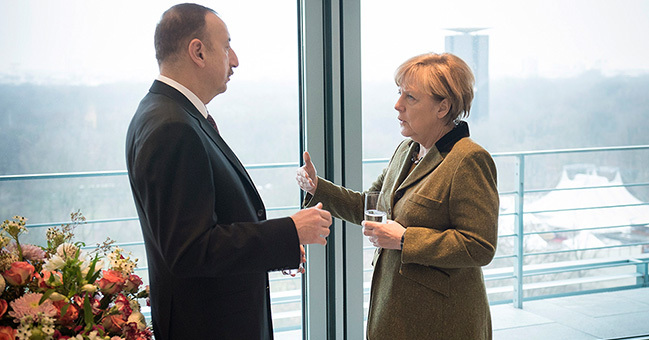 Merkel and Aliyev also discussed domestic policy issues, especially the human rights situation in Azerbaijan. The Chancellor stressed that Germany has wide-ranging relations with Azerbaijan, embracing not only the economic and political spheres, but also matters relating to civil society. German foundations and other organisations must be sure that they can work on a sound and secure legal basis, she said. Since 2001, Azerbaijan has been a member of the Council of Europe. It is thus obliged to adhere to the rule of law and democratic principles. In spite of differences of opinion on this point, the Chancellor believes that the most important thing is to keep the lines of communication with Azerbaijan open. Rights organisations have called on Merkel to press Alyiev on rights. Human Rights Watch insists that Merkel should make clear that Germany will not send a high-level government delegation to the European Games unless activists behind bars are freed. Azerbaijan will host the first-ever European Games, a sort of Olympic games for athletes representing 50 National Olympic Committees of Europe, from 12 to 28 June 2015. Reportedly, Azerbaijan’s relation with the EU was also discussed. “Azerbaijan would like – if I have understood correctly – to have positive cooperation with the EU,” Merkel is quoted as saying, adding that this in no way means that the country has any ambitions to accede to the EU. Reportedly, Azerbaijan is disappointed by the EU’s Eastern Partnership project, which has sought rapprochement with Ukraine, Moldova, Belarus, Georgia, Armenia and Azerbaijan. The country has given up plans to seek EU association, and prefers a relation with Brussels of the type of the “strategic partnerships” the Union has with countries like South Korea or South Africa. Azerbaijan’s closes ally is Turkey, a country whit which its historic relations have not always been easy. Nagorno-Karabakh is one of the so-called frozen conflicts in the post-Soviet territory. It is a landlocked region in the Southern Caucasus, de jure on the territory of Azerbaijan, but de facto governed by the Armenian-backed breakaway government of the Nagorno-Karabakh Republic. An armed conflict between Armenia and Azerbaijan took place between 1988 and 1994 over Nagorno-Karabakh. A Russian-brokered cease-fire was signed in May 1994. In August 2008, the US, France and Russia began to negotiate a full settlement of the conflict, proposing a referendum on the status of the territory. The effort culminated in the signature in Moscow by Armenian President Serzh Sarksyan and his Azeri counterpart Ilham Aliyev of an agreement to hold talks on a political settlement. Vesti, Azerbaijan: ?????? ??????? ?????? ?, ??? ??????? ? ?????? ?????????????? ????? ??????? ?? ???????? Haqqin, Azerbaijan: ?????? ???????? : ?????? ??????? ????????? ????????? ? ?????? ?